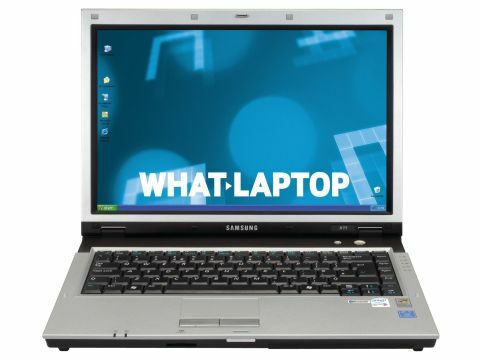 Samsung has created something of a reputation for itself as a manufacturer of thin and lightweight laptops. The X11 (£710 inc. VAT) continues this trend, and with strong connectivity, a portable 1.8kg weight and integrated graphics, it targets the corporate user. You'll find a colourful, sharp, Super-TFT screen with a 16:9 aspect ratio. Measuring 14.1-inches, and with a resolution of 1280 x 800 pixels (WXGA), there is plenty of room for more than one window on the display. Befitting its status as a business machine, an integrated Intel 945GM graphics adapter supports the display, and uses up to 128MB of system memory. The X11 achieved a 3DMark 2003 score of 1254. Users will have no trouble running office applications, browsing the Internet, or watching DVDs. The styling is neat and tidy, with an angular design, and a silver and black finish. The keyboard has good-sized keys, and a well-judged action makes it easy to type at speed. All of the buttons are firmly attached, and move without noise. The coarse, responsive touchpad mirrors the screen's aspect ratio, and has a scroll bar on the side. Brushed aluminium buttons add a tactile, quality feel to the machine. There's a generously sized palm rest, making the X11 a comfortable laptop to use. Despite getting thinner towards the front of the machine, the chassis still offers rigidity, and is capable of withstanding everyday use. An Intel Core Duo T2300 is at the heart of the machine, and runs at 1.66GHz. With 512MB of DDR2 memory, the X11 may not have the highest specification in the group, but achieved a respectable MobileMark 2005 score of 221 points. We found it to be a quick laptop, able to run several applications simultaneously without lag. An 80GB hard drive offers ample storage, and a battery life of 187 minutes, under test conditions, makes a morning's work away from the office possible. Essential for a business machine, you'll find Gigabit Ethernet, enabling fast connections to fixed networks. To take advantage of wireless hotspots, an 802.11a/b/g Wi-fi adapter is built in. For connecting to external displays, you'll find S-Video and VGA-out sockets, ideal for presentations. A Bluetooth adapter allows you to transfer files wirelessly, and there's also a 6-in-1 card reader. The X11 is the only machine in this group to exclude a DVD rewriter, featuring a CD-RW/DVD drive in its place. The Samsung X11 has a lot to offer for the asking price. It has most of the features corporate users demand, and offers more performance than many higher-specified machines.